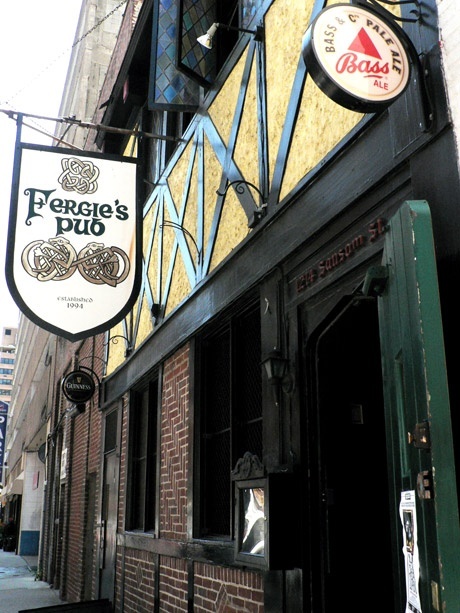 Fergies Pub – A gem in the heart of Philly! Ok, so before you think Hi-Fi has “jumped the shark” and become a blog about pubs and beer read on and give us a chance. Last month I was in my hometown of Philadelphia, PA to catch the Flyers versus Canadians game; a that allowed them to clinch a playoff spot for this current season! I make the pilgramage to “The City of Brotherly Love” every year for my birthday, and beforehand I always plan my weekend out hour by hour, so that I make the best of my time. One of the key things in my life is food and beer (aside of hockey and music) so with a vast array of incredible places to eat in Philly, you really need to plan ahead. After putting in a hard day of blogging at Hi-Fi Central, I decided to explore recommended pubs in Philly – always worthwhile and a deserving reward after trekking any major city is a good microbrew…or two. During my search I came upon a blog that recommended a place called Fergie’s Pub; Fergie’s seemed to offer a fine array of ever revolving microbrews, and also the added treat of live music! I planned to visit it pre-Flyers game, eat some dinner, and get a good buzz on prior to my trek to the Wells Fargo Center. Part of the appeal of visiting Fergies Pub is that it was also located on Sansom Street, a street that my ancestors once resided on in 1870, so to walk the very street seemed very sentimental, and again, a good excuse to perhaps have a (ahem) third beer in honor of their memory. I had been staying at the Sofitel on 17th and Sansom, so the location seemed right, but prior to departing I decided to ask the concierge what they thought of Fergies. Instantly their eyes lit up and the looked at each other with disbelief, apparently few of the clientele of a Sofitel ask for a good seedy Irish pub when in Philly. All three suggested that I go and said that timing (3:00 on a Saturday) was perfect since at 4:00 “The Sessions” begin; “sessions” I asked, what is that? I was informed that at 4:00 this group of regulars comes in, parks it at a table with their pints and plays a few hours of free form Irish music; but space becomes limited very quickly. So, I rushed down and found Fergies Pub, entered and was instantly welcomed by the waitress asking us how many and before we sat down what we would like to drink. The beer menu offered about 15 beers on tap, and the food was excellent. After we got settled we drank a pint and sure enough the waitresses started moving the tables around to make room for a group of people, about 4 in all, to sit down and prepare to play. The group consisted of a guitarist, two fiddles, and an accordian player, it didn’t take long for them to get started and the music was excellent. Much of the music was impromptu jamming and at times they would just fade out and drink their beers and then start up again by sheer impulse, clearly they knew each other rather well and their timing was spot on. At one point a mother walked in with her daugther (I think about 9) and the little girl got out her fiddle and jumped right in not missing a cue; it was excellent! Philadelphia, if you’ve either never been there or have visited only a few times is truly a fun city. Last year I blogged about visiting a church on 20th and Christian streets called St. Charles Boromeo where my great-grandparents were married in 1907, just to find out the church and the mass had converted into an amalgum of both Catholic and Gospel influences, just something completely unexpected. Check out Fergies Pub on a saturday afternoon if you are every visiting Philly, the beer, food, and service are excellent, but the music just adds a special twist.